Lord Jesus, I believe that You are the Son of God, the Messiah who came in the flesh to destroy the works of the devil. You died on the cross for my sins and rose again from the dead. I now confess all my sins and repent. I claim forgiveness and cleansing (1 John 1:9). I believe that Your blood cleanses me now from all sin. Thank You for redeeming me, cleansing me, justifying me and sanctifying me in Your blood. 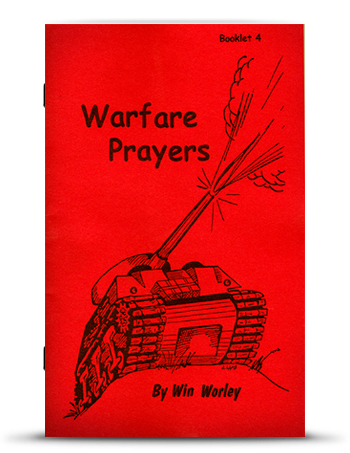 The above is an excerpt from “Warfare Prayers, Booklet #4″ by Pastor Win Worley. Copyright © 1983 by Win Worley, Revised © 1991, WRW Publications 2004. All rights reserved. No part of this publication may be reproduced or transmitted in any form or by any means, electronic or mechanical, including storage and retrieval system, without securing permission in writing from the publisher, WRW Publications, PO BOX 9309, Highland, IN 46322.